Calling all volunteers! This Friday is the last day for students to use their REP points. We would love your help! On April 23, May 3 and May 10 we will also need extra help as we will be selling Mother’s Day gifts to the students. If you have anything you would like to donate to the REP store, please label and deliver it to the front office. Thank you for your help! Its time to order yearbooks! $35 to preorder. They will go up to $40 once they arrive (with limited supply). Please put the payment in the white payment envelope in the school safe (near the front office). Follow the link below to purchase your tickets today! The REP Store is open on Fridays and we need your help! Please click here to sign up to work at the REP store on Friday mornings. It's a 30 minute commitment that makes a big impact on our kids! What exactly is PBIS and REP and how does it impact my ECMS students? Schools are successful when they help children grow academically, socially and emotionally. For this to happen we must have a safe environment that is supportive and conducive for growth in these areas. By setting forth clear social and behavioral expectations, and directly teaching students about those expectations, we hope to create a positive atmosphere for optimal learning. ECMS's plan is based on Positive Behavioral Interventions and Supports (aka PBIS). Our goal is to teach children alternative behaviors to ensure a school environment that is safe, fun and free from distraction, and ultimately helps all children reach their maximum learning potential. ECMS has three school-wide expectations: Demonstrate Respect, Effort and Pride (REP). Throughout the year, students are taught about what it means to demonstrate each of these expectations. PBIS encourages consistent, positive rewards to celebrate student success. Students who are “caught” following the behavioral expectations are rewarded with REP points. These points may be used to purchase school supplies or privileges in the classroom. Students may also visit the REP Store on Friday mornings between 8:45am and the first bell. Store items change as donations are made from our Partners in Education, parents, community members. etc. Items "sold" in the store include school supplies, stuffed animals (a favorite! ), small toys, homework passes, eat lunch with a friend passes, gift cards for local restaurants, and other knick-knacks. We also have raffles the kids can enter for things such as gift cards to the movies, X-Drenaline, Game Stop, etc. We will hold a Mother's Day Market around Mother's Day for kids to purchase items for the special women in their lives..
YOU can help make the REP store a success. Volunteer in the shop on Friday mornings. Sign up or donate to the store- we will have bins in the front office, or arrange to get donations picked up by contacting us. If you have questions or have items that you would like to donate to the REP store, please contact Elizabeth Cervantes, REP Store Co-Chair at 404.643.8125 or by email at elizabeth.cervantes@johnstonemeyergroup.com. Are you prepared for the daily hidden dangers that our children face today? Does your child know what to do? Do you know what to say? On Tuesday, January 15 at 6pm, the ECMS PTSA will bring Susan Norris from Rescuing Hope and Jeff Shaw from Out of Darkness to speak to us about protecting our children in this online world. There will be separate forums for parents and students. We ask that you please RSVP students and parents before the event. Students must attend with parents. For more information and to RSVP, please click here. The Atlanta Gladiators and the Georgia PTA have teamed up again for an exclusive opportunity to purchase discounted Atlanta Gladiator tickets throughout their 2019 season at Infinite Energy Center. 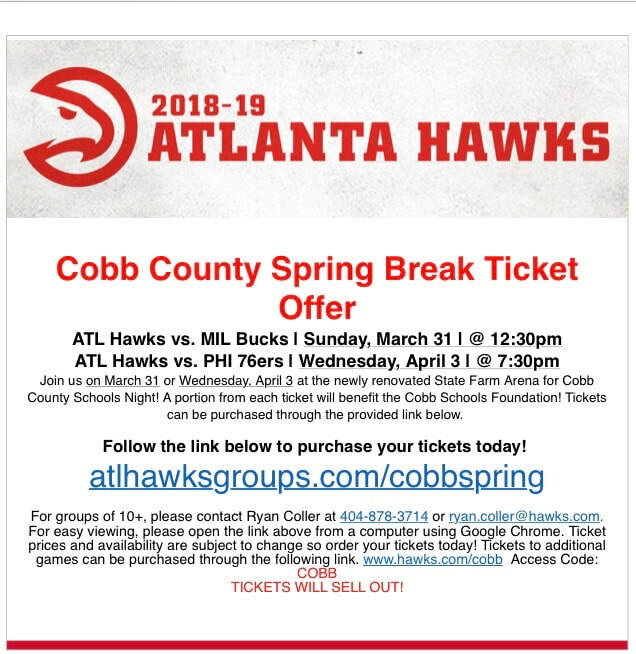 In addition to receiving this exclusive discount, the school of your choice and the Georgia PTA will receive a portion of each ticket sold. Be sure to put in your organization's name to make up to $7 per ticket, minus taxes. Fundraiser Checks are presented after your event. Please share the event with your friends, family, and class! People who buy from your link will sit with you for the game.